Cycling fever will grip the peninsula twice this year, as Wirral will host the annual Tour of Britain event for the first time as well as a holding a round of the OVO Energy Tour Series in Birkenhead in May. 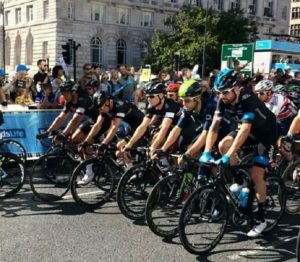 The Tour of Britain will head to Wirral this September as a part of the area’s celebrations as the Liverpool City Region’s Borough of Culture for 2019. While this will be the prestigious cycle race’s debut on the Wirral, this year’s event will mark the tour’s return to Merseyside for the first time since 2014 when thousands of spectators lined the streets of Liverpool. Councillor Phil Davies, leader of Wirral Council, told JMU Journalism: “This is incredibly exciting news. We can’t wait to welcome the Tour of Britain to Wirral. Both occasions are to be broadcast on ITV4 and across the world, and are expected to attract a six-figure spectator attendance for the two days of activities. Nik Ellis, founder of Wirral-based company, Laird Assessors, told JMU Journalism: “It is an extremely proud moment to see the Tour of Britain staged in Wirral for the first time. “Working in the cycling industry and being a passionate bike rider myself, I believe this will do wonders to raise the profile of the sport in the region. Further details of the Tour of Britain, which will see the world’s top teams and riders heading to Merseyside, will be announced as part of the full national launch in the spring.